Mix them all together to create one of the most hilarious, most dramatic, moving stories of love, Whizz Fizz, witches, murder and madness, from the bestselling and funniest children’s author in Australia. Andy Griffiths is Australia’s most popular children’s writer. He is the author of more than 20 books, including nonsense verse, short stories, comic novels and plays. Over the past 20 years Andy’s books have been New York Times bestsellers, won more than 50 children’s choice awards, been adapted as a television cartoon series and sold over five million copies worldwide. Andy is best known as the author of the much-loved JUST! series, The Day My Bum Went Psycho and the treehouse series. In 2008 Andy became the first Australian author to win six children’s choice awards in one year for Just Shocking!, smashing his previous record of four awards for The Bad Book in 2005. In 2008 Andy and his wife, Jill, collaborated with The Bell Shakespeare Company on the popular and critically acclaimed theatrical production ‘Just Macbeth!’ which was nominated for two Helpmann Awards. 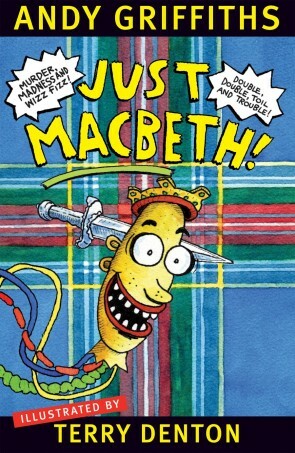 In July 2010 ‘Just Macbeth!’ completed a return sold-out season at the Sydney Opera House before heading to the Edinburgh Fringe Festival. The book of the play was shortlisted in the children’s section of the 2010 Prime Minister’s Literary Awards. Andy has had a long-standing collaboration with the multi-talented illustrator Terry Denton. Together they have produced the JUST! series, the wildly popular The Bad Book and The Very Bad Book, two ridiculous illustrated guides What Bumosaur is That? and What Body Part is That?, as well as the Seussian-inspired early readers The Cat on the Mat is Flat and The Big Fat Cow that Goes Kapow!. In 2011 Andy and Terry started a new series with The 13-Storey Treehouse, which won the Book of the Year for Older Children Award at the Australian Book Industry Awards in 2012. Andy is passionate about inspiring a love of books and reading, and this passion drives his work as an ambassador with The Indigenous Literacy Foundation to provide books and literacy resources to remote Indigenous communities around Australia. Terry Denton has illustrated more than 100 books, twenty of which he has also written. He won both the Multicultural Book of the Year and the Best Designed Picture Book in 1993. In 2003 and 2008 he was shortlisted for the Aurealis Award. His work has also won more than 40 children’s choice awards throughout Australia. In 2008 Just Shocking! won all six children’s choice awards in Australia. He has also been shortlisted by the CBCA many times. He has three children and is the owner of a back garden burial ground for dead pets.